Though small in terms of size, Milledgeville is gigantic by the numbers. 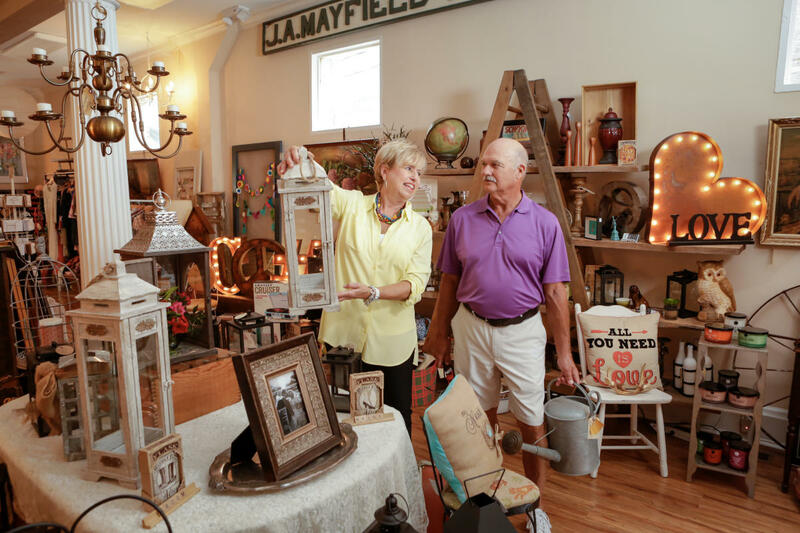 This cozy and quaint antebellum town is home to hundreds of things that make it oh-so-special. Join us as we break down Milledgeville by the numbers to show you all just how many things our town has to offer! Photo courtesy of Gregory Miller, Atlanta Magazine. One of Milledgeville’s most iconic landmarks is Central State Hospital, Georgia’s first public psychiatric hospital. Patients were treated with the most cutting-edge psychiatric treatments of the 19th century, such as lobotomies and electroshock therapy. 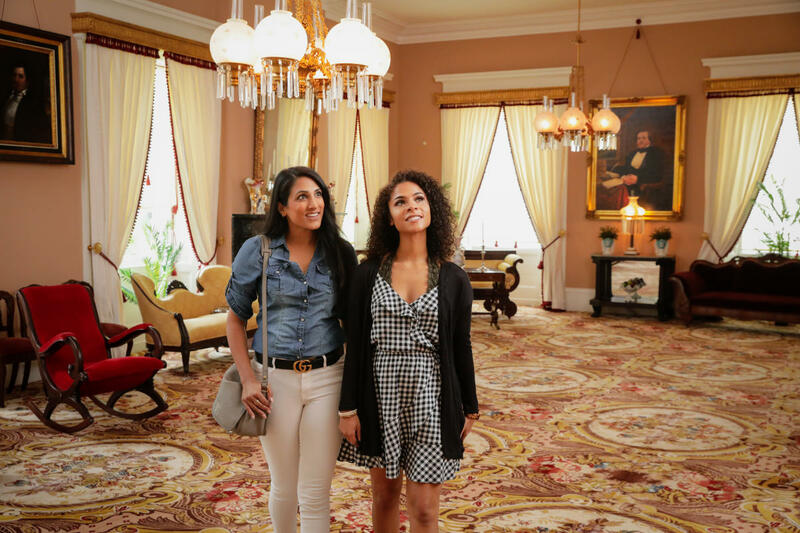 Though Central State is no longer in operation, its campus remains open for visitors. Drive through the empty streets and peruse the abandoned buildings (exterior only) if you are in for a thrill. 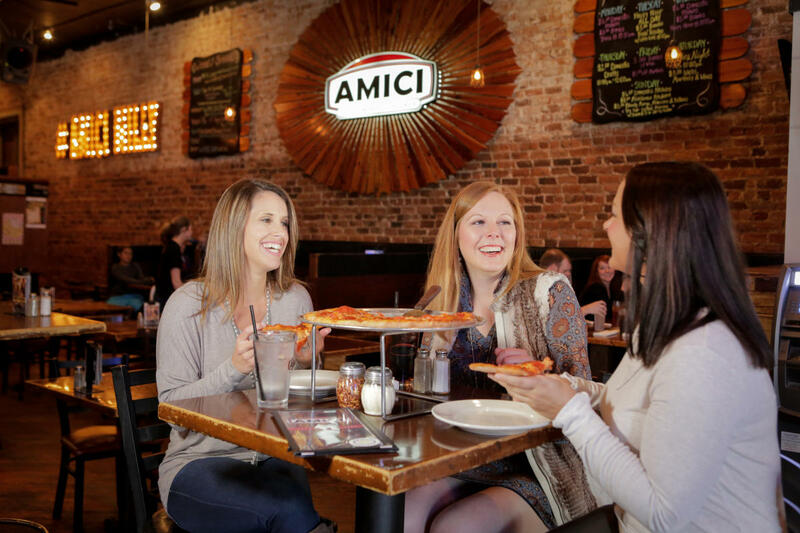 In the heart of Downtown Milledgeville lie two authentic pizzerias: The Brick and Amici. Whether your taste buds are craving a unique flavor combination from Amici’s toppings or the soft, thick crust of a pizza from the Brick, these two will provide for any and all of your pizza needs. Our personal favorites are The Brick’s “Hawaii Five-Oh” and Amici’s “Muay Thai,” but any type of pizza you choose (or create on your own) will bring you joy. 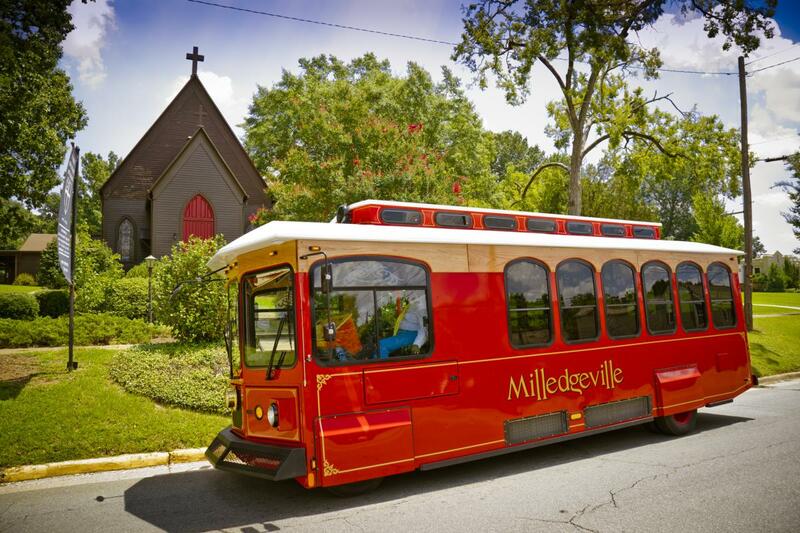 Our Historic Trolley Tour is a staple of Milledgeville, giving visitors a full historical background of the city. Occurring once daily at 10 a.m. Monday – Friday and 11 a.m. Saturday, the trolley stops at three separate locations in which guests are invited to step off of the trolley and walk around. The three stops consist of the Old Capitol Building, a historic Milledgeville home (Rose Hill Monday-Wednesday; Brown Stetson Sanford House Thursday-Saturday) and St. Stephen’s Episcopal Church. Not only does Milledgeville provide for all of your pizza needs; it satisfies your sweet tooth as well. There are four unique locations in Downtown Milledgeville to get a treat unlike any other. Aside from caffeinated beverages, Blackbird Coffee offers milkshakes, smoothies, ice cream and delectable giant cookies (peanut butter is our favorite flavor). Doodles Cupcakes offers cupcakes along with a wide variety of treats and savory foods. 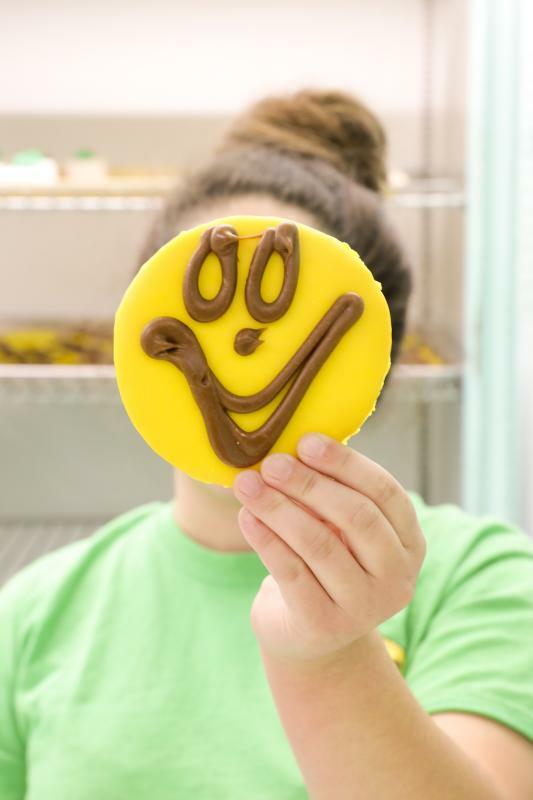 Ryals’ Bakery specializes in pastries and are known for their iconic yellow smiley-face sugar cookies. SweeTreats provides creamy, made-to-order ice cream treats, along with specialty pound cakes. With these four locations, Milledgeville truly has something for every lover of sweets. Milledgeville is home to an expansive historic district with homes of Greek Revival influence, Victorian style and even our own Milledgeville Federal architectural aesthetic. Majority of the homes are private residences, but five are open regularly to the public for tours. Completed in 1839, Georgia’s Old Governor’s Mansion is one of the finest examples of High Greek Revival architecture in the nation. 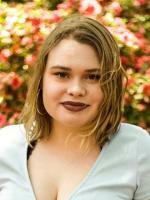 First settled in 1814, Andalusia was a cotton plantation and farm until it was purchased by the uncle of famed American author Flannery O’Connor who resided there from 1951-1964. Rose Hill, a Greek Revival home circa 1852, is the centerpiece of the Lockerly Arboretum, and presides over its surroundings with elegance and grace. An architectural gem built by John Marlor in the “Milledgeville Federal” style, the Brown-Stetson-Sanford House was once the Beecher-Brown Hotel and then the State’s Rights Hotel. The Sallie Ellis Davis House was the home of a dedicated and passionate Baldwin County educator, she believed that through a combination of hard work and education one could accomplish anything. Aside from eating, sightseeing and historical attractions, Milledgeville boasts a pretty stellar shopping scene. Just in the downtown area alone, there are six boutiques; each having something different to offer. Firefly Boutique, French Vill’edge, Southerndipidy, and Jack & Milly provide wide selections of trendy boutique clothing. If you are not looking to expand your wardrobe, two spots on N. Wayne St. have something different to offer. Eclectic provides a wide range of jewelry, trinkets and home decor (make sure check out their vintage signs and posters). The Market Collective also provides home decor, as well as handmade soaps, specialty foods and gifts. Two of TMC’s most notable items are their homemade beer-and-wine glass candles and their iconic Milledgeville pennant flags.